Abbreviated VGA, Video Graphics Array is a standard type of connection for video devices such as monitors and projectors. Generally, VGA refers to the types of cables, ports, and connectors used to connect monitors to video cards. Though VGA is still in use today, it's rapidly being replaced by newer interfaces like DVI and HDMI. VGA cables have 15-pin connectors: 5 pins at the top, 5 in the middle, and the other 5 at the very bottom. The picture at the top of this page is an example of a VGA cable showing all 15 pins. A VGA port on a desktop or laptop naturally has the same number of pin holes so that a VGA cable can plug directly into it. Each and every pin has its own function. For example, the first pin is for transferring the color red, while the second and third are for green and blue, respectively. Computer Hope has more information on the purpose of the other twelve pins. All types of computer cables take on a specific gender - male or female. A male cable is one that has its connections protruding, or sticking out of the cable. Female connections are the reverse, having inward holes that allow the male cable to fit perfectly with the female connection. VGA cables are no different. The picture at the top of this page shows a VGA cable with two male ends. This cable goes from the monitor to the computer, where it's met with a female connection from the video card. With VGA, DVI, and HDMI video cards and monitors all mixed in together in the real world, you're bound to want a VGA converter if all you have a is a VGA monitor or VGA video card. For example, if your computer has a video card that only supports VGA, but you've just bought a new monitor that only has DVI and/or HDMI ports, you must either replace your video card to get one with newer ports, get a different monitor that supports VGA, or buy a VGA converter. The same goes for if your video card only supports HDMI and/or DVI, but all you have is a monitor that accepts a VGA cable. It can be confusing to understand what type of converter you need. Do you need a VGA to DVI, or a DVI to VGA converter? An HDMI to DVI converter, or is it called DVI to HDMI? Keep reading for some clarification. A VGA to HDMI converter is what you need to convert the VGA signal from your computer to the HDMI port on a monitor or TV. Get this if your computer has a VGA port on the video card, but you want to use an HDMI monitor or TV as the display. Some VGA to HDMI converters even have a USB cable embedded with the converter that carries audio along with the video signal (since VGA doesn't transfer audio) so that you can play sounds through a display with embedded speakers, such as an HDMI TV. An HDMI to VGA converter does just the opposite: connects a video card with HDMI output to a monitor or TV that has a VGA input connection. Since HDMI is newer than VGA, this type of converter is helpful when you're connecting a new desktop or laptop to an older display. Both of these converters are readily available online and at electronic stores. Amazon sells a number of VGA to HDMI converters, as well as HDMI to VGA converters. As you'd guess, a DVI to VGA converter is required if you need to connect a video card with DVI to a display that has a VGA port. DVI to VGA converters are usually DVI male to VGA female converters. This means the DVI end of the converter plugs directly in to the DVI port in your video card, while the VGA end of the converter is used with a male to male VGA cable for connecting the converter to the female end of the display device. These types of converters are easy to find and relatively inexpensive. Amazon sells a number of DVI to VGA converters but you'll find them everywhere. VGA to DVI converters also exist but can be rather expensive and hard to find. This type of converter is required if you need to move video from a VGA video card to a DVI monitor. DVI to VGA converters work because the signal is going from digital to analog, which is just a matter of translation in the DVI pins since DVI carries both analog and digital signals. VGA carries just analog, so going from VGA to DVI requires a converter to change those analog signals to digital. Amazon sells this Monoprice brand VGA to DVI converter but it's pricey. Upgrading your video card to support the newer monitor would probably be less expensive and a smarter choice in the long run. Some VGA converters require you to have a VGA cable in addition to the converter, something to keep in mind if you're shopping around for one. For example, this is common with HDMI to VGA converters. The converter may be made up of an HDMI cable with a VGA converter box all in one cable, but the VGA box has a female connection just like your monitor or TV, so you'd need a male to male VGA cable to finish the connection. If all of this converter talk is confusing and you're still not sure what kind of cable to buy for your specific setup, just look at the ports themselves to see if you need the ends to be male or female, and then look for a converter that matches that. 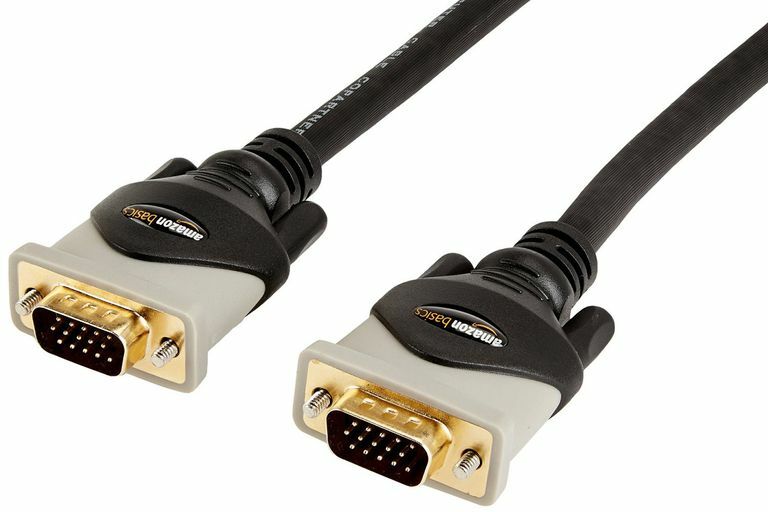 For instance, if the monitor and video card both use female ports, you'd want to get a cable that has male connectors on both ends. The only other distinction that needs to be made is identifying the type of connection at both ends; whether they're VGA, DVI, or HDMI, but that shouldn't be difficult given that they look very different from one another. The image the top of this page is a VGA cable with male ends, meaning that it can only be used to connect to a monitor and video card that both use female VGA ports. In place of the standard VGA connector, some laptops and other devices may use what's called mini-VGA, though it has never been as popular at the standard VGA connector. Mini-VGA looks more like a USB port than a VGA port (here's a photo of one), but it's still used for video just like the standard VGA port. There are also mini-VGA to VGA adapters that will allow a standard VGA display device connect to a computer that has a mini-VGA port. Similar to DVI replacing VGA, mini-DVI is now more widely used than mini-VGA. You may need to Update Drivers in Windows if your new configuration isn't supported by your oold drivers. If your display settings are setup incorrectly, causing your monitor to display nothing at all, you can boot to Windows using a lower video resolution. Windows 10 and Windows 8 users can do this through Startup Settings via the Enable low-resolution video option. In Windows 7, Windows Vista, and Windows XP, this option is found in the Advanced Boot Options Menu (called Advanced Boot Options in XP). It's listed as Enable VGA Mode in Windows XP.